Please note, contact details are purely for non-commercial purposes. For commercial purposes contact webadmin@rpoas.org.uk. 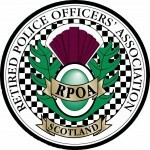 If you are interested in learning more about the Retired Police Officers' Association Scotland, or wish to join, please email your details and enquiry to the Secretary (above) or to the Secretary of the Branch you wish to join, listed below or fill in the online application form.